Music Together in the City - What are Music Together classes like? 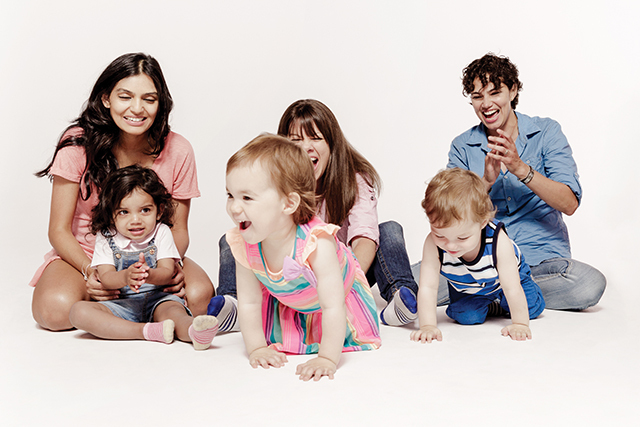 Music Together® is for infants, toddlers, preschoolers, and their parents/caregiver. The classes include songs, rhythmic rhymes and movement, and instrument play activities that are developmentally appropriate for the children and easy for parents and caregivers, regardless of their own musical ability. Music Together® is a music and movement approach to early childhood music development for infant, toddler, preschool, and kindergarten children and their parents, teachers, and other primary caregivers. Originally offered to the public in 1987, it pioneered the concept of a research-based, developmentally appropriate early childhood music curriculum that strongly emphasizes and facilitates adult involvement. The Music Together approach develops every child's birthright of basic music competence by encouraging the actual experiencing of music rather than the learning of concepts or information about music. It began as an educational project of the Center for Music and Young Children and is now being taught internationally. Music Together CD's, songbooks, and classroom techniques enjoy widespread use by teachers and families both directly and indirectly involved in Music Together. What are Music Together classes like? Children and their parents or caregivers (nanny, babysitter, grandparent) meet weekly for 45 minutes each for six to eleven weeks to experience new songs, chants, movement activities, and instrumental jam sessions. Both adults and children sit in the circle and participate, led by a certified Music Together teacher with early childhood and music skills. The teacher helps adults understand how to participate and the importance of relaxing and enjoying the activities with their children. Children have many opportunities to create and to play - making up rhythm patterns, making up new words to songs, making up movements to express a sound. Some children will simply stare and "study" the experience, as they absorb the musically rich environment. Other children will sing, play and dance freely, because they are in a comfortable, encouraging environment and because they know the songs and chants from the songbook and CD they take home. Each class has ritual features which the children need and enjoy such as the "Hello Song," the instrumental "Play-Along," a lullaby, and the "Goodbye Song." Eight to ten other experiences are included in each class, ranging from free movement to songs in unusual meters. Music Together classes use Informal Instruction allowing children to learn at their own speed. Children may or may not participate as they choose and do so according to their developmental level. The class experience, reinforced by CD listening and parent involvement, stimulates learning at home through play. The enjoyment doesn't stop when the class is over. Each semester families receive a song collection and recording of original compositions and traditional songs performed by outstanding singers and instrumentalists. The children will often ask to hear the Music Together CD in the car and a home, or when friends come over to play. The songbook often comes, out at bedtime or naptime and is used as a storybook. Parents are encouraged to "read" the songs, even if they don't read music. At home, parents also enjoy their children singing parts of Music Together songs and dancing spontaneously to music. Years after your child takes a Music together class, he or she will still remember the "Hello Song" and other favorites. Parents of former students tell us "We still have those CDs!" With a childhood of Music Together experiences, your child will be among the young people who have a deep-seated love of music-making. Enjoy! • Mixed Ages: Activities focus on adult/child interaction rather than child/child interaction, so children of different ages (such as siblings) can enjoy class together. Also, many childhood educators consider mixed-age groupings beneficial and the process of music development throughout this age range is similar. Adults, regardless of their own musical ability, find it fun and easy to help create an environment that supports any child in achieving basic music competence. Children participate at their own level in classes of mixed ages by singing, moving, chanting, listening, and exploring musical instruments. • Infants: Infants blend with any age group. We have found that early exposure to music greatly benefits their musical development. The rewards for this can be seen as they grow and develop.